Joe Pasteris received his Bachelor of Music degree in Performance from Northern Illinois University in 1989. 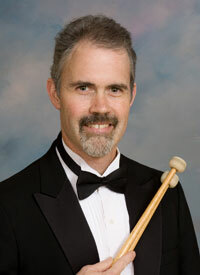 A lifelong DeKalb resident, Joe has been performing as a percussionist with the Kishwaukee Symphony Orchestra and DeKalb Municipal Band since 1988. Since his involvement with the KSO, Joe has developed his skills and benefited as a complete musician. He enjoys the long-lasting relationship with the orchestra.